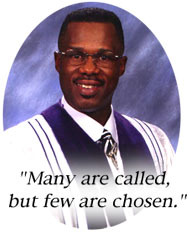 Reverend John Willie Cade was born October 2, 1956 to the late Fannie Mae Holmes and the late Willie Hearst. Educated here in the Lexington School System.. He is one that gave his life to God at an early age. Pastor Cade joined Files Chapel as a child and began his Christian journey singing with the Youth Chorus of Files Chapel known as the Young Adult Chorus. Singing is where he formed his spiritual foundation, which prepared him for greater things to come. 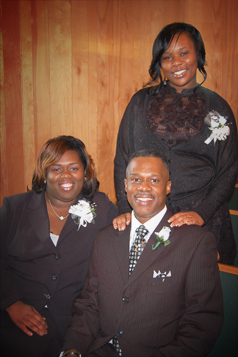 Pastor Cade, his daughter Tamara, and granddaughter Markisha Cade. Many are called but few are chosen. Pastor Cade feels confident that he was chosen by God to do work for him. He received his calling in the mid-seventies, but it wasn't until 1980 that he began to carry the good news. He was licensed here at Files Chapel and ordained through and by the Rowan Baptist Association in 1982. Pastor Cade Pastored New Faith Baptist Church from 1986 to 1993 and then returned back to Files Chapel in obedience to God to support and help his Father in ministry to carry out the work of God. After the death of our Pastor Dr. F. D. Betts, Pastor Cade, humbly stood and followed the orders of God to march on and keep hope alive. Here today as the fourth pastor of Files Chapel Baptist Church, Pastor Cade has served us faithful for the past eight years. He has a daughter, Tamara Cade and a granddaughter Markisha Cade, whom he always keeps close to heart. When you ask the question where he got his spiritual education, he is happy to say that God blessed him to study under one of the greatest Theologians that ever lived, Dr. F. D. Betts. He taught me and prayed that I always have the fear of God in studying the word of God and trusting in the power of God and we shall prevail in the spirit of holiness.